Where can I find My Credit Alert? The Equifax My Credit Alert service is no longer offered to new customers (If you’re an existing My Credit Alert customer find out more here). If you’re looking for a credit alert service you may consider one of our other subscription services which offer a credit alert. Equifax ID Basic – An identity theft protection and detection service to help you safeguard your identity. Get credit alerts which monitor certain changes to your Equifax credit report, identity monitoring to detect if your personal details are being traded on the dark web and Identity Guard insurance in the event you have been the victim of identity theft. Equifax Premium – Get on top of your credit profile and protect your identity. Keep track of your Equifax credit report and Equifax score. You’ll get your Equifax credit report quarterly, Equifax Score monthly along with an Equifax Score Tracker and the top four contributing factors. And then there’s credit monitoring through alerts to help protect your credit reputation. Equifax Ultimate – Proactively manage your credit profile with a monthly Equifax credit report and Equifax score with our most comprehensive credit and identity consumer subscription plan. Find out the key factors that impact your Equifax Score and track it over time. Plus help safeguard your identity with credit alert and identity monitoring. We’ve also got you covered with Identity Guard Insurance. Once you have requested a copy of your free Equifax credit report or a My Credit Alert subscription you will receive your credit report within one business day, provided we are able to verify your identity. Your credit report holds information relating to your credit history. If you've ever applied for credit or a loan it is likely you will have credit information held by a credit reporting body like Equifax. Credit can come in many forms. Along with credit cards, personal loans and mortgages, credit also includes mobile phone, electricity and gas contracts as well as store and rental finance. Your credit report can help lenders, phone and utility companies get a clearer picture of your credit worthiness. It helps them understand your current credit commitments and how likely you are to be able to make repayments on future loans. Getting a copy of your Equifax credit report can help you understand where you stand when it comes to applying for credit. It is important to check your credit report regularly to ensure it is accurate. What is on my business credit report? File access information is also included. This outlines who has accessed your credit report. Only credit providers, suppliers and Equifax can access your report, with your permission. Your credit report contains a summary, which is a good place to start. Here you will see a total of credit enquiries, any accounts you have, overdue accounts and details of commercial credit you may have. You can then review this information in more detail. If you find something that is inaccurate you can have it investigated. You can either contact the credit provider the information relates to using a handy list of creditor contacts or contact Equifax using our corrections process. How do you get the information that is on my credit report? The information held on your Equifax credit report is provided to Equifax by credit providers, like banks, phone and utility companies as part of an application process for consumer or commercial credit or as part of their ongoing management of your account. In addition to this, Equifax obtains writs and judgement information from third parties like the courts, personal insolvency information from AFSA and directorship information from ASIC. What is a credit score (Equifax Score)? Your credit score (Equifax Score) is a number between 0-1200 that summarises the information on your credit report. Your credit score is calculated based on the information held on your credit report at a given point in time. Generally, the higher your credit score, the better your credit profile. Banks and other lenders can use credit scores to as part of determining whether an applicant qualifies for a loan. Your credit score can also play a part in the terms of the loan including the borrowing limit and the interest rate. My Credit File from Equifax does not include a credit score. You can visit Equifax and choose from a range of products that include your credit report, credit score and additional features to help manage your credit profile and protect your identity. Find out more about Credit Reports, Scores and Credit Alerts. You can also get a copy of your Equifax credit report for free. Please contact us or call us on 13 8332 to change your email address. There is something wrong on my credit report. How do I fix it? If you believe information on your credit report is incorrect you can have it investigated by the credit provider or Equifax for free. Search our list of common creditor contacts or you can use the corrections process from Equifax. If you wish to submit a correction request with Equifax, you will require specific details of the entries you are disputing such as the date the entry was listed on your credit file, account/reference numbers and amounts. Please ensure you have the details of all dispute entries before proceeding with the submission of a correction request. If you do not have a current copy of your Equifax credit report or the specific details of the disputed entries, you may not able to complete the correction request form. How can I update the information on my credit report? If you believe information on your Equifax credit report is incorrect or inaccurate you can have it investigated by the credit provider or Equifax for free. Search our list of common creditor contacts or you can use the Equifax corrections process. Why is the credit report PDF file password protected? Your credit report contains confidential personal information that should not be accessed by anyone else without your permission. In order to help keep this information secure, Equifax has password protected the file. Why can't I open my file on my smartphone or mobile device? The PDF attachment is designed for viewing through your computer. Some mobile devices are not compatible with password protected PDF files. To open your Equifax credit report you may need a PDF reader app which can be downloaded from your app store. The PDF app may provide the ability to open password protected PDF's. There are various apps available depending on mobile operating system. Please visit your app store to determine which app is best for you. If you are unhappy with the service you have received, about the outcome of a correction request, or have any other concern please raise a complaint to our Internal Dispute Resolutions (IDR) team by sending an email to customercomplaintsAU@equifax.com. Make sure that you sufficiently detail your concerns and what outcome you are looking for. Please include your full name, contact details, any reference numbers and relevant supporting documentation. Our IDR team will investigate your matter and contact you to attempt to resolve the matter directly. Learn more: Credit Smart also provides information on credit industry complaints. Where do I login to manage my subscription? Our My Credit Alert service credit alerts are delivered to you via email. There is no need to log in to manage your details. If you have an annual subscription to the My Credit Alert service, your alerts will be sent to the email address you supplied when you signed up for the service. If you would like to change the email address for your alerts, please contact us or call 13 8332. A default is also referred to as an overdue debt. A consumer payment default is debt equal to or more than $150 and is more than 60 days overdue. For example, if you have a telephone bill of over $150, and it was due more than 60 days ago, it could be listed on your credit report as a payment default by the telco provider. Before listing a consumer default, the credit provider must take a number of steps such as sending two separate written notices to your last known address requesting payment stating that the debt may be listed with a credit reporting body (like Equifax). In the case of commercial credit the minimum default amount is $100. Before listing commercial defaults or overdue debts commercial credit providers or their agents must send a notice to your last known address stating their intention to list the default amount with a credit reporting body such as Equifax. Potential credit providers may look unfavourably on applicants with a history of overdue accounts, so it’s a good idea to avoid defaults getting onto your credit report. To do this, you need to ensure you pay your bills before they become overdue. Both consumer and commercial payment defaults stay on your credit report for five years, even when you have paid the overdue amount. The status of the default is updated to paid which can be looked upon more favourably by lenders but it will remain as part of your credit history. Looking for your credit file? What is monthly repayment history? Your monthly repayment history on credit accounts like loans and credit cards can be recorded on your credit report by a credit provider. If you pay your credit card or loan repayments more than 14 days past the due date this can be recorded on your credit report as part of your repayment history information as a late payment. This repayment history information is recorded on your credit report for a period of two years. While one late repayment, depending upon how late the payment is, is unlikely to significantly impact your credit worthiness, a number of late payments could be an indication you are in financial stress and may negatively impact your credit report. How is my credit report used when I apply for credit? My credit application was declined. What should I do? If you have been declined credit and the information on your credit report was a factor, the lender, phone or utility company will give you details of the credit reporting body they used. If it was Equifax, the first step in understanding why your Equifax credit report has contributed to you being declined credit, is to obtain a copy of your credit report. By getting a copy of your credit report you can better understand where you stand when it comes to applying for credit. It is important to check your credit report regularly to ensure it is accurate. If you have been declined credit you are entitled obtain a free credit report if you apply within 90 days of being declined and provide evidence that a credit provider has declined your application for credit. Only you may request a copy of your own Equifax credit report. For security reasons, you will be asked to verify you identity prior to receiving a copy of your credit report. Once you have your credit report you can check that the information listed is correct. If you find something that appears to be inaccurate on your credit report it is important that you have the items investigated, and corrected, if required. Equifax can help you to investigate this for you for free. Equifax takes reasonable steps to ensure that your credit report is accurate. However, as we rely on information provided by a number of different sources, errors can occur. It's important that you check your report and let us know if there are any administrative errors such as an incorrect date of birth, or a misspelling of your name or street address. You should also check that the credit information listed on your credit report, such as an overdue debt or enquiry is accurate. Once you have made any required corrections, you can also work to improve your credit worthiness. Need more information? The ASIC MoneySmart website also has information about loan rejection. There is no set frequency with which your credit report is updated. Your consumer credit report may be updated monthly, every time account repayment history information such as if you have paid a credit card, or other personal credit, on time is added. If it has not been paid on time this will also be recorded. Your credit report may also be updated whenever you apply for credit, open or close an account, change your credit limit or agree to act as a guarantor for someone else. Credit providers may also update your report when they list any overdue debts you may have incurred and we may also add certain information obtained from third parties, such as default judgments, court writs and Bankruptcy Act information. Your business credit report may be updated whenever you apply for credit, change your credit limit or are listed as a new director. Credit providers may also update your report when they list any overdue debts you may have incurred and we may also add certain information obtained from third parties, such as default judgments, court writs and Bankruptcy Act information. Can I have a default removed from my credit report? You can only have a default removed if it was listed in error. If you have a default on your credit report it will remain there for five years. If you pay the default, the status will be updated to ‘paid’ however it cannot be removed. What is the difference between a score and credit report? An Equifax credit report is the detail of your credit history to date whereas a score is simply a number which is derived from the information on your credit report. Your Equifax credit score is not part of your credit report and is generated at a point in time. Comprehensive credit reporting changes the type of consumer credit information that can be collected by credit bureaus and used by credit providers when making a lending decision. The Privacy Act 1988, which is the legislation governing consumer credit reporting in Australia, was amended on 12 March 2014 to introduce comprehensive credit reporting. Previously Australia had a negative reporting system. This meant consumer credit reports could only contain information such as credit enquiries (typically applications for credit e.g. a personal loan or credit card) and information from credit providers such as payment defaults and serious credit infringements. Under a comprehensive credit reporting system positive data is able to be included on credit reports. Most developed countries in the world operate under a comprehensive credit reporting system. The positive data that can be included on credit reports includes account information such as the date an account was opened and closed, credit limit, type of credit account as well as 24 months repayment history. Repayment history information can only be provided by and shared with licenced credit providers - this doesn’t include telco and utility companies. This means that if you make your repayments on time each month this good credit behaviour will be recorded on your credit report. If you pay your credit card or loan repayments more than 14 days past the due date this can be recorded on your credit report as part of your repayment history information as a late payment. Only licensed credit providers such as banks and financial institutions are able to disclose repayment history information to a credit reporting body like Equifax. Telco and utility companies are not licensed credit providers and cannot supply or receive this information. However, a default can be recorded on your credit report by any credit provider (including telco and utility companies) if you miss a payment which is more than $150 and is more than 60 days overdue. Before listing a default the credit provider must have taken steps to collect the whole or part of the outstanding debt. This means they have sent you are written notice setting out the amount overdue and seeking payment and a separate written notice advising you that the debt may be reported to a credit reporting body. A default remains on your credit report for five years. If you pay your credit card or loan repayments more than 14 days past the due date this can be recorded on your credit report as part of your repayment history information as a late payment. It is unlikely one late payment, depending upon how late the payment was, followed by making your repayments on time, will significantly impact your credit worthiness, however, a number of late payments could be an indication you are in financial stress and may negatively impact your credit report. This repayment history information is recorded on your credit report for a period of two years. If you are struggling with debt ASIC MoneySmart also provides more information about managing debt. What is a serious credit infringement? The term serious credit infringement relates to consumer overdue debts where an individual owes a debt to a credit provider but has left or appears to have left their last known address without paying that debt and without providing the credit provider with their new or forwarding address. A serious credit infringement can be listed on a credit report in this case if the individual has not had contact with the credit provider for six months or more despite attempts by the credit provider to contact them. 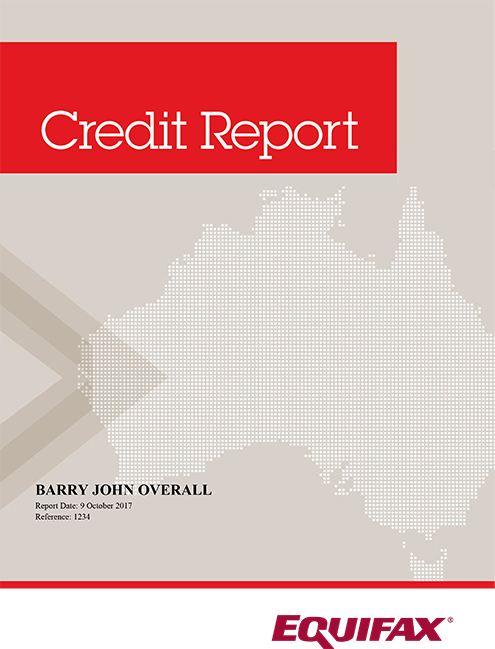 Consumer serious credit infringements remain on a credit report for seven years from the date they're listed. However, if they have been paid they revert back to a default and will remain on the report for five years. The fact that an amount has become overdue and then been paid becomes part of your credit history. In the case of commercial credit clearouts, if you can't be contacted and it appears to the credit provider that you have left your last known address and you have not provided the credit provider with a forwarding address, they can immediately list the debt on your report as a clearout, even it hasn't been overdue for 60 days or more. These commercial clearouts will remain on your credit report for seven years regardless of whether they are paid or not. How do I place a ban on my Equifax credit report? If you have reasonable grounds to believe you have been or are likely to be victim of fraud, you can request a ban on the disclosure of your credit reporting information to be put in place. The initial ban period is for 21 days, but can be extended upon your written request if there are reasonable grounds with documented evidence.. This can help prevent fraudulent accounts being opened in your name. While a ban is in force, credit providers cannot see credit reporting information on your personal, public or commercial credit report without your specific written permission. Contact Equifax (and other credit reporting bodies) to put a ban on your consumer credit information. The initial ban period is for 21 days and can be extended. This can help prevent fraudulent accounts being opened in your name. The ban period means that if a credit provider requests your credit report as part of an assessment of a credit application Equifax cannot share it unless you have provided written consent or if it is required by law. You can find out how to put a ban on your credit report here. I think I may be a victim of fraud. Can I place a ban to block anyone accessing my credit information? If you have reasonable grounds to believe you have been or are likely to be victim of fraud, you can request a ban on the disclosure of your credit information to be put in place. When Equifax receives and actions such a request, the ban extends not only to personal credit information but also to any commercial credit or publicly available information Equifax holds. Whilst a ban is in force, credit providers cannot see information on your personal, public or commercial credit report without your specific written permission. Find out more on what to do if your identity has been stolen. How can I prevent credit fraud? What happens if I report my identity as being stolen? Your records are investigated. The credit provider(s) will then conduct their own investigations and notify us of the outcome. We can then remove any fraudulent information from your credit record. You can also put a ban on your Equifax consumer credit report. The initial ban period is for 21 days and can be extended. This can help prevent fraudulent accounts being opened in your name. The ban period means that if a credit provider requests your credit report as part of an assessment of a credit application Equifax cannot share it unless you have provided written consent or if it is required by law.